Nitin Pant from Jalandhar, B.E. - B.Tech Graduate. 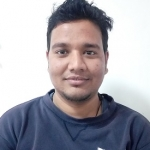 LINUX SYSADMIN) AMAZON WEB SERVICES EC2 RDS IAM HADOOP ADMINISTRATOR..
are one of expert skill area's of Nitin Pant . Nitin Pant is working in IT Software industry.